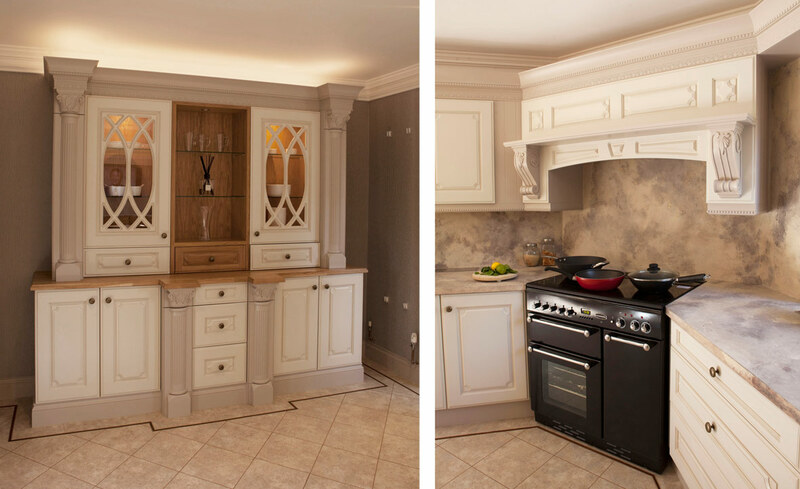 A new traditional kitchen design concept infusing hand-painted finishes, natural oak and a revolutionary product. It was second time around for Mr & Mrs Blackwell of Chingford, Essex; since they had worked with Broadway Kitchens in their previous home. 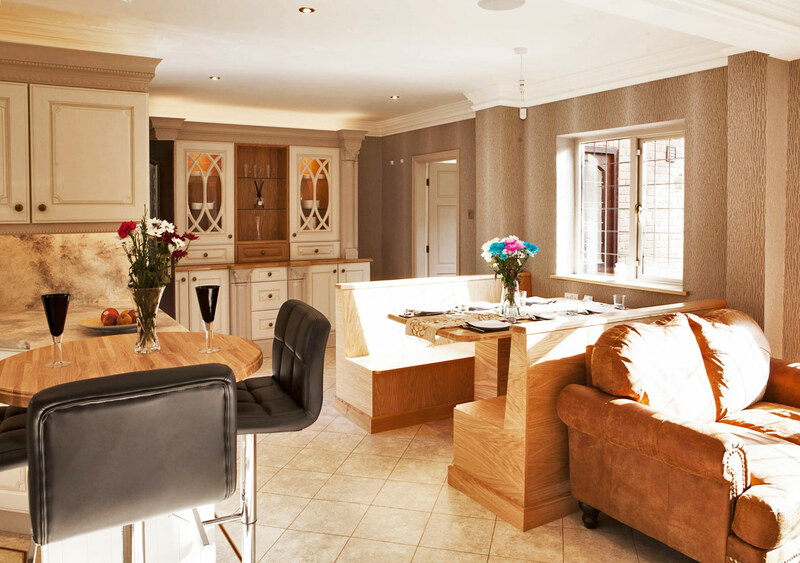 In their new 5-bedroomed home there was never any question as to whom they would return to to create a new kitchen utilising the latest design concepts. “We wanted a large, sociable kitchen space for family get-togethers just as Broadway had created at our previous home. However, this time we were a little more confident and keen to try some new ideas from a family business that we already knew we could trust.” Said Mr Blackwell. The downstairs layout of the Blackwell’s home was badly laid out with its collection of tiny rooms and hallways; it required radical change as Mr Blackwell also points out: “It was like a bunny warren of small rooms linked by a ‘pokey’ hallway; this made for a very tiny, dark kitchen. You wouldn’t think that you were in a large 5-bedroom property! Working with Broadway’s father and son design team, Satt and Sunny Sembhy, a classical kitchen design was created, incorporating traditional design clues such as a raised and fielded, plant-on door design, reeded pilasters, ornate cornicing and planked end panels. Whilst this might sound relatively ordinary, there is far more to this kitchen design than immediately meets the eye. The kitchen features ‘Microstone’ – concrete worktops and splashbacks. This is something relatively new to the UK and a specialist process perfected by Broadway which involves manufacturing, casting, colouring and sealing on site. Not only does this represent something a little different to the more usual, tried and tested, granite approach but you also have no visible joins in the surface. Furthermore, you have the flexibility to continue the process onto the walls and around windows. Close inspection of the worktops reveals exquisite details such as texture with a specialist gold leaf and grey paint finish. Integrated into the worktops are no fewer than four S-Boxes; a double award-winning product available from Broadway (see photos above). The S-Boxes use the otherwise wasted void behind a base cabinet for additional pop up accessories; in this case two additional 3-pin socket boxes, a knife box and a spice rack. These S-Boxes prevent worktop ‘clutter’ as well as giving pop-up power sockets, utensils and cooking ingredients as and when you want; immediately to hand. The kinetic (non-electric) pop-up 'S-Box' mechanism is simply activated by the push of a finger. The box is then pushed back down when not in use. 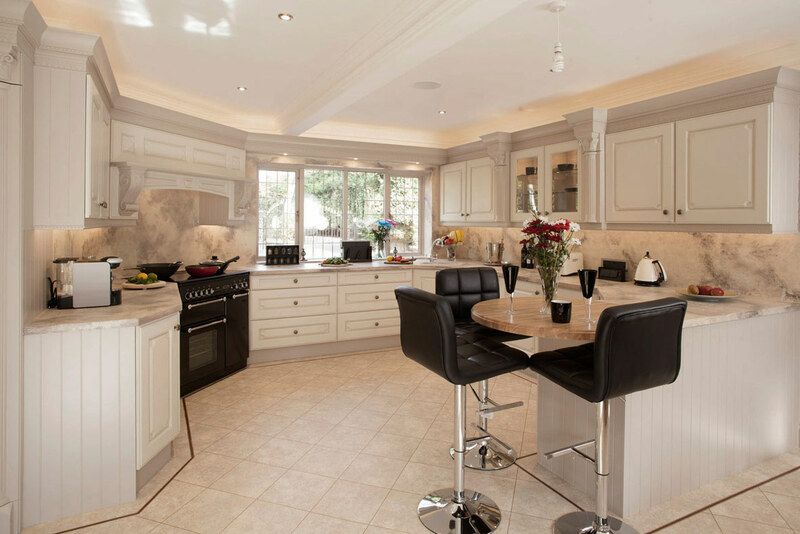 With maximum family use, socialising, relaxing and dining all in mind, the kitchen was meticulously planned. Informal dining comes in the form of a round, oak breakfast bar, incorporated into the peninsula island, whilst a custom-made oak table with matching oak bench seating offers the opportunity of a more formal dining arrangement. Once dinner is finished, what better way to relax than on an easy sofa looking out through French doors onto the garden or perhaps having a cold drink from the American style fridge freezer whilst watching the wide screen TV?